Russia has experienced a scorching hot summer that included a prolonged drought. 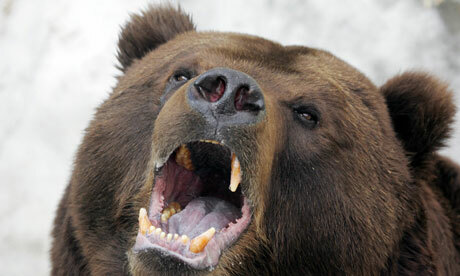 Russian brown bears are mostly vegetarian, but most of their normal food supply has disappeared. So they have taken to raiding cemeteries in much the same way wolves raided them in the Middle Ages. In the Old West, wolves were notorious for digging up graves and eating the bodies. It has been suggested that wolves learned to hunt people throw grave robbing, so let’s hope that Russian brown bears don’t learn this habit. If they do, Vladimir Putin will have to shoot them or do Judo on them. Or call Sarah Palin up to shoot them from an airplane. I’m not sure if burials in Russia are the same as over here, but wouldn’t the embalming fluid make the bears sick? Embalming is forbidden for Eastern Orthodox Christian burials.